Driving in the N.E. ? Never Never Never solely rely on a GPS, always correlate that to an Atlas and i also use Google maps to find the correct entrance to a customer. GPS can and will lead you into a field or down a street to a cauldesac or somewhere else not accesible for trucks. Now if we're talking Interstate then by all means GPS is awesome. I use the newest Rand Mcnally (whatever model number it is) and I will say it works decent. BUT it has tried to take me a few places where there is specifically a sign that says "No Trucks Allowed" especially in the North East, things are all wacky up there. Not sure what year youre looking at but make sure it's a 4.0L engine. Yes the gas consumption will be nothing to brag about but you can't destroy those engines. I have a 99 Grand with 166,000 and just made a cross country move from WV to Phoenix, AZ and it purred like a kitten. 300,000 is very average for these vehicles as long as it's been maintained. Roehl drivers, do you like it? I will be moving to Phoenix in less than a month and would like to find a company there where I could get more Hometime than OTR gets. I noticed Roehl Transport has a southwest "regional" than mostly runs from Phoenix to Souther Cal and around the area... Anybody in this division or drive for Roehl? If you drive for them do you like it? Pros, Cons? One Thing I'm Both Mystified and Amused About: Why the AVERSION To NYC Runs? So here in a few months me and the ole lady are moving from the hills of West Virginia out to the desert of Arizona. I've got 6 months OTR experience but my question is how many regional/dedicated kind of opportunities are out there? I know back east there's a million jobs to have for the picking, so do things run the same out west? I know it's a little different story since everything is so spread out. I've been with US Xpress and they've been good to me so far, let me run good and hard, but I'm thinking them, probably like most companies, only want team drivers out west. Anyone have any recommendations for good companies to look into out there? I know just about every state has some sort of Idle law limiting the amount of time we can idle. However, has anyone actually had any problems with being told to shut off or received a ticket? With summer just around the corner this has peaked my curiosity as I've been all over the country and have never once seen or heard of anyone getting "in trouble" for idleing. Its a 2012 peterbilt. Its really frustrating the shop keeps saying everything is working fine on it, but waking up every two hours to start the truck and warm it up is starting to get really old. Let me start this by saying this is only my second week solo driving, however I'm not an idiot ;-p. For the past two weeks I've only made two trips because my truck has been in the shop. There's a problem with the low voltage detector that keeps kicking off the bunk heater, and Of course the truck has an anti-idle on unless it's 25 or below outside. So needless to say it gets very cold in the cab without heat. So I have to wake up every hour or two to turn the truck on to warm it up then go back to bed. Everytime I bring it to the shop they keep telling me there's nothing wrong with it...I don't need all the bells and whistles some trucks have, all I ask is for a little heat when I'm trying to sleep haha. I got into the business to be out there covering miles and making money, not sitting at the shop. I'm thinking of finding another company but I know how important it is to stick with your first company for your first year. Any suggestions of what to do? So I finally got turned back in and now I'm officially a Solo driver, woohoo! They assigned me a 2012 Pete with an 8speed. I've never driven an 8speed before so how much different is it from a 10speed, and anybody have any tips on shifting, especially going up and down steep hills? So I'm about 3/4 of the way done with my trainer and we had a hell of a week this week... In a very cool way! How many miles a day during training did you guys drive? 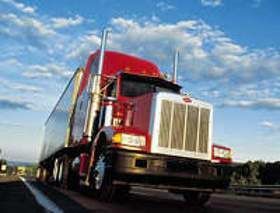 How many miles did everyone average a day while driving OTR with a trainer? I know there are a ton of variables but just a rough guess.